In March 2016, the Utah legislature passed House Bill 116. The bill was signed into law by Utah Governor Gary Herbert later in the month. The bill modified provisions in the Utah code related to the determination of who is considered a joint employer. The bill comes after a series of actions by the National Labor Relations Board. In 2014, the NLRB found that McDonald’s could be named as a joint employer in addition to individual franchisees after allegations were made by some employees. The NLRB investigated charges alleging that McDonald’s and its franchisees violated rights of employees when actions were taken against employees who participated in protests against the employer. The NLRB has since filed complaints against McDonald’s and some of its franchisees, and hearings have begun before an administrative law judge. For more information about the NLRB’s action, click here. In an effort to protect franchisors from liability as joint employers, Utah enacted H.B. 116. The impact of the NLRB ruling could be far reaching because franchisors could be held liable for labor violations on the part of individual franchisees. In the past, franchisors were not considered joint employers because joint employers must exert a certain level of control over the employment relationship. Although franchisors do have some control over franchisees, generally decisions about the employment conditions such as wages, benefits, and schedules are left to the individual franchisees. There was also an NLRB decision in 2015 expanding the standard for a joint employer. In Browning-Ferris, the NLRB expanded the standard for determining who is a joint employer and found that Browning-Ferris was a joint employer along with the staffing company that supplied employees to Browning-Ferris. For more information about the Browning-Ferris decision, click here. Although this NLRB decision did not involve a franchise, the expansion of the joint employer standard by the NLRB could impact the franchise industry as well. (1)For purposes of determining whether two or more persons are considered joint employers under this chapter, an administrative ruling of a federal executive agency may not be considered a generally applicable law unless that administrative ruling is determined to be generally applicable by a court of law, or adopted by statute or rule. (b) With respect to a specific claim for relief under this chapter made by a franchisee or a franchisee’s employee, this Subsection (2) does not apply to a franchisor under a franchise that exercises a type or degree of control over the franchisee or the franchisee’s employee not customarily exercised by a franchisor for the purpose of protecting the franchisor’s trademarks and brand. The bill included other similar amendments and additions to other sections of the Utah code. H.B. 116 adds clear language stating that, under usual circumstances, a franchisor shall not be considered an employer of the franchisee or the franchisee’s employees. It also attempts to limit the effects of the NLRB’s ruling until the ruling is applied by the courts or enacted by statute or rule. H.B. 116 is designed to protect franchisors from being considered joint employers and from being subjected to additional liability for such claims. Utah is not the only state to enact legislation after the NLRB’s ruling. Other states such as Texas, Louisiana and Tennessee have also enacted legislation limiting who is considered a joint employer. This legislation is evidence of the disruption and concern in the franchise world caused by the NLRB findings. It seems very likely that other states will follow their lead. If you have questions about how changes in joint employer determinations might affect you or your business, contact us today. Our experienced Mesa business attorneys are here to help. 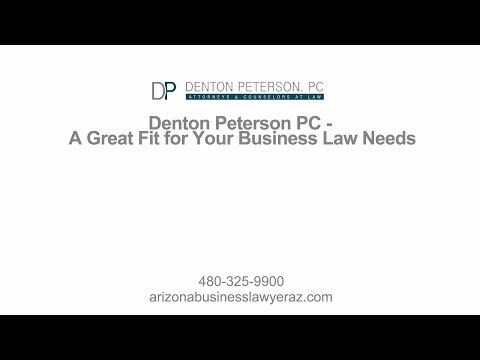 The Arizona business lawyers at Denton Peterson can assist you with issues regarding franchise law, employment law, and litigation, and can also help you with other business related needs.